President Donald Trump said on Tuesday he was prepared to close the U.S. southern border if necessary but that Mexico has apprehended thousands of people in recent days and its actions have made a big difference in the immigration situation. 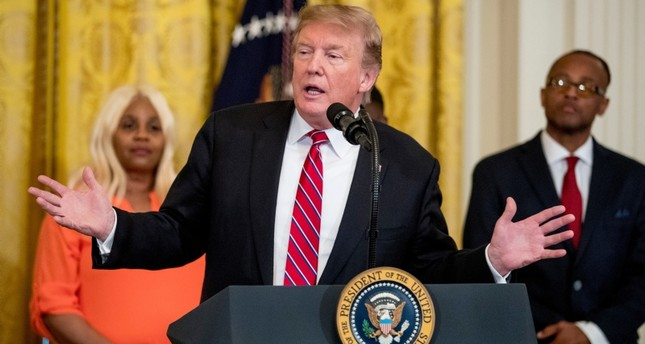 "If they don't, or if we don't make a deal with Congress, the border's going to be closed, 100 percent," Trump told reporters in the Oval Office, doubling down on a threat he first made at the weekend. Trump went on to say he was ready to "close large sections of the border, maybe not all of it." On Tuesday, Trump spokeswoman Sarah Sanders said, "Eventually, it may be that it's the best decision that we close the border," but that the president "is not working on a specific timeline" and will "look at all of the options on the table." The Council of Economic Advisers is conducting a number of studies on the potential impact of closing the border and "working with the president to give him those options," she said. That was a sign of efforts within the administration to slow-walk and minimize the impact of Trump's renewed threat last week to seal the border, and quickly. "I am not kidding around," the president said then, plainly exasperated by the migrant flow. White House spokesman Hogan Gidley said in an appearance on MSNBC that the White House is now considering a number of options short of a full border closure, including shutting down certain entry ports or parts of all of them. "Everything is on the table," he said.